A sublime century from Mark Nelson saw Great Brickhill climb back up to second in Cherwell League Division 1 with a comfortable win over Twyford. All five of Great Brickhill’s bowlers took a wicket, with one run out from skipper Graeme Carter as the home side set 234-7 from their 53 overs. 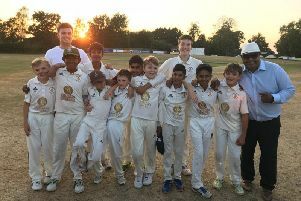 But the Brickhill innings got off to a bad start as opener Patrick Sreenivasaprasad had to retire injured with just six runs to his name. But fellow opener Nelson , who scored 110, was joined at the crease by Carter (51), and the pair put on a formidable 181 run partnership to put the visitors firmly in control as Brickhill (251-4) eased to victory. Wolverton remain at the wrong end of the table after losing to new leaders Thame Town. Chasing Thame’s 206 (Hassam Mushtaq 5-34), Wolves came up short, scoring 150.